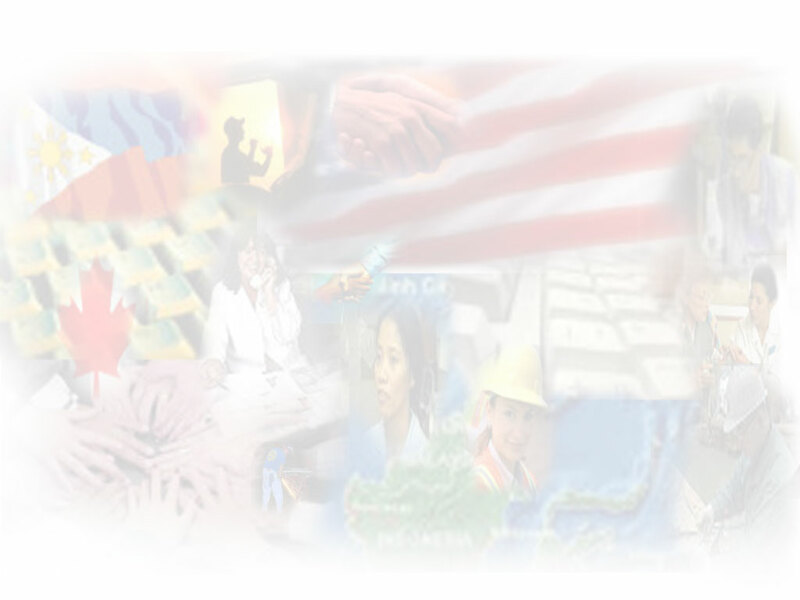 Applicant: Welcome to Hirefilipino.com - Get ready for a new job! Prepare your RESUME' then click here for your free evaluation. Yes, there are opportunities out there waiting for you! You must have read the literatures about U.S., CANADIAN, SAUDI ARABIA and other ASIAN countries wanting to hire Filipinos. HFC seeks new member-employers everyday to present them your qualifications. But your records have to be there in our database when they conduct their search. Start your career move today by signing-up. The slots are limited, first come - first served. 1. What are the Preferred Job Positions? 7. Is this service applicable to other Filipinos working and living in Hong Kong, Taiwan and Middle Eastern countries like Saudi Arabia? 2. My work expertise or specialization is not on your preferred list, is there a market opportunity for me? 8. How much is the membership fee? 3. What are the HFC's criteria for membership? 9. Will HFC claim a percentage of my salary assuming I get hired by a foreign employer? 4. What is the "Limit on Job Slots" all about? 10. Who has access to my records after I get approved? 5. How can local residents currently in the Philippines apply? 11. I love to haggle for a higher salary, if I refuse a job offer from the first or second employer that contacted me, will that affect my record with HFC? 6. Can anyone apply for membership? 12. Here's a guide to the step-by-step registration process. The list of preferred job positions is based on our initial survey on the most number of actual employer needs. HFC is certain that the changing needs of the current member-employers and of course the requirements of the new ones will require new job positions. As a matter of fact, when a need for a new position matches an unlisted position like your own, then that could be an advantage because of a reduced competition. First and foremost, you have to be a Filipino. There is a higher chance of being approved for membership also when your position matches one of the preferred positions. The HFC applicant selection team uses a set of rules that was derived from a meticulous study of the hiring practices of foreign employers for minorities in the U.S.
Another important criteria is the hiring quota of HFC. Applicants may pass the evaluation but may not be approved when the hiring quota is already full. In a situation like this, it will be a FIRST-COME-FIRST-SERVE basis. Quota is discussed in the following question. In order to preserve the credibility and effectiveness of its services, HFC set a limit on the number of approved applicants for each Job Position. Each quarter of the year, a new quota is determined based on the actual manpower demand. 5. How can local residents in the Philippines apply? All applications are conducted online, just fill-out the online application form. If your application merits an approval, a payment instruction will be e-mailed to you based on your location, together with the approval notice. 6. Can any Filipino with any expertise apply for membership? Theoretically, yes. All job position are open even those that are not found in the preferred list. All applications are subject to the evaluation of our selection team. Absolutely yes. Since HFC is an internet-based operation, it has prospective clients in literally every country that has access to the internet. HFC will strive to make its services a household name in every country that patronizes Filipino workmanship. For all applicants : Registration fee is FREE! Absolutely no. HFC will not have any claim on your salary whatsoever. It will be an arrangement solely agreed upon by you and your potential employer. Other than you, all of our member-employers may view your resume' from our database while it is active. We strongly discourage having to turn down an employer up to a second time. Not only will it affect HFC's relationship with its member-employers but also it is not a smart decision for you as an applicant. Be very specific on your questions to the employers so that they will be able to address your concerns completely. Start today. A great life is the result of starting. There's the old saying everyone's familiar with "a journey of a thousand miles begins with a single step." In order to even move from the couch to the refrigerator, you have to start. There's no better time to start than today. Don't wait for a raise, or until you get older, or the weather is better. Today, right now, is the right day to start to take a step in the direction of your heart's desires. It's what you do TODAY that will make a difference in your life tomorrow.